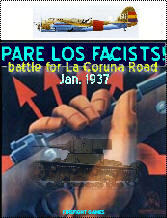 PARE LOS FACISTS (Stop the Facists) is a simulation on the critical battle also known as the Battle for the La Coruna Road that took place from Jan. 3 to 16th, 1937. In this particular phase of this Nationalist offensive (planned by the German advisors and their Blitzkrieg tech-nique) it was the first time the German Panzers met the Russian T26B tanks. Although their numbers were small, both altered their doctrines because of them. The goal for the Nationalists was to cutoff Madrid by seizing all roads to the west and the city water supply (just off the north map edge). It was also hoped that other Nationalists troops would be able to cutoff Madrid from the north and east. This game simulates the last phase of the Facists offensive. The game system uses an action point method that requires players to plan out thier attacks and advances. The first half of the game has the Republicans struggling to stem the Facists attacks, all with different objectives. 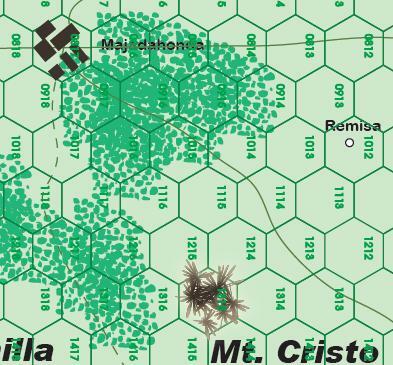 The game's final 3-4 turns are always a nailbiter as Russian tanks and International brigades pour in to counterattack in and around Los Rozas! Each Day Game Turn represents one day of real time. Each map hexagon represents 500 yds from side to side. Each unit counter represents a battalion or company. Tank units represent 4-5 tanks, each air-craft is a squadron, each AT unit is a battery of 4 guns. Paul Kantro 9 9 9 Looks wonderful. I had been looking for a Spanish Civil War game that was affordable.